During a France-Singapore Business Forum in Paris last week, Mr. Jean Burelle, Chairman of the MEDEF International, the French Business Confederation, has flagged work visas as an issue to French businessmen who have plans to expand to Singapore. PM Lee also acknowledged that Singapore still has to manage its foreign worker and immigration policies carefully as it still requires foreigners for its economic and demographic needs. He asserted that this is because no society can generate that range of skills, experiences and talent on its own. Hence, it must seek talent from all over the world. For example, he said that Singapore is investing to make its own workforce more productive in sunrise industries. In the same swoop, professionals like scientists and workers in the construction and manufacturing sectors would help complement Singapore’s workforce and make it vibrant economic hub. Taking foreign talents out of the equation simply isn’t realistic or meaningful. While we understand the pain points felt by many Singaporeans, this issue, like PM Lee said, must be handled carefully and has great bearing on our progress as a country and economy. Secondly, he said foreigners help Singapore’s demographically. Like many developed nations, Singapore has a growing ageing population and a low fertility rate. New permanent residents and citizens who want to sink deeper roots in Singapore may procreate or migrate with their families, thus growing Singapore’s population. Although these needs are pertinent, PM Lee explained that Singapore’s immigration and foreign worker policies must be sustainable over the long term and contribute to a larger social and political good. 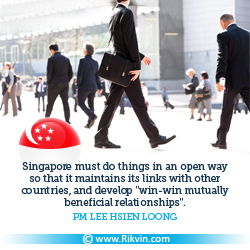 At the same time, Singapore must maintain some openness as an economy in order to nurture win-win relationships with other countries. During the visit to Paris, PM Lee met French President Francois Hollande and reaffirmed the strategic partnership and keenness to improve bilateral trade through the newly enforced EU-Singapore Free Trade Agreement (EUSFTA) as well as other avenues in Asia and the Eurozone. Mr Hollande affirmed that Eurozone is stabilizing and that investment and collaborative opportunities are available for Singapore companies in France. There are currently more than 1000 French companies in Singapore, representing a 50% increase since 2008. As discussed last year, in our blog “Singapore Must Maintain Strategic Open-Door Policy on Pain of Further Brain Drain,” it is more prudent for the city state to maintain a strategic open-door policy in order to maintain a vibrant economy that in turn serves Singaporeans well. “Taking foreign talents out of the equation simply isn’t realistic or meaningful. While we understand the pain points felt by many Singaporeans, this issue, like PM Lee said, must be handled carefully and has great bearing on our progress as a country and economy,” said Mr. Satish Bakhda, Head of Operations at Rikvin.